G4K Tricky Fox Escape is another point & click escape game developed by Games4King. There were a few houses in a beautiful and magnificent village. The location and the housing were very beautiful. There was a tricky fox at that place. One day, that tricky fox was unexpectedly stuck in a house. Your loyalty is to rescue the tricky fox. 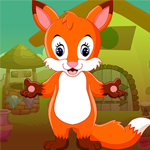 It will help you to find the hidden clues and items where the tricky fox is to save the animal. Find them all and free the tricky fox. Good luck and have fun! My game seems to have an error. No sign in the middle scene house for arrow directional clue. LOL, I can't even get in a house! I have stuff in inventory and a paper clue but can't find spots for anything. I'm stuck with fruit and heart clue. I was too. had to watch the walkthrough. The heart clue is for the sliders. they are all at slightly different levels. tried it several times before it opened. Yep game is missing directional puzzle in house #4. can't finish so not bothering anymore. I think there may be a new employee at G4K who released the game too soon. :-) Willing to try again if they fix it. Maybe they should rename the game, "Tricky Missing Puzzle Escape"